1 Bedroom Flat For Sale in Surrey for Asking Price £325,000. Ideally suited apartment for those requiring a ground floor apartment. 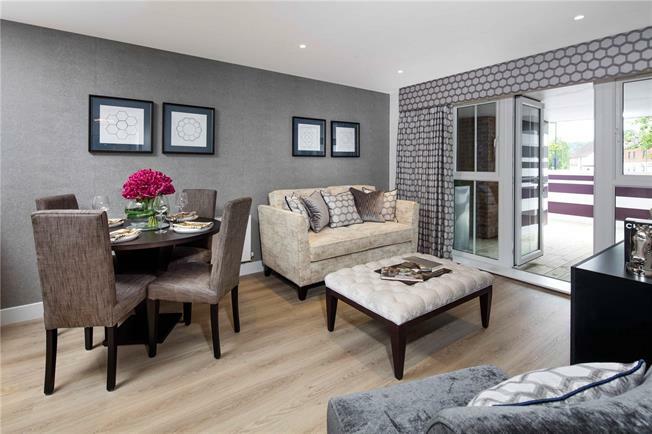 With a total area of 504 sq ft and priced at £325,000, Prime Place are offering investors a £1,625 per month rental payment for a 12 month leaseback. Currently the Sales & Marketing, the apartment will be converted into one bedroom apartment. Master bedroom will come carpeted, along with built in wardrobes. The open plan is combined sitting room is connected with contemporary kitchen, which comes with integrated electric oven and hob, dishwasher and fridge freezer. The bathroom is fitted with wc, basin and bath including shower fitting and screen. Apartment comes with secure underground allocated parking space. A one bedroom ground floor apartment in this exclusive development with a private patio area, within Godalming town centre. Please note images may computer generated images or of the show home. Prime Place represents an exceptional opportunity to live in the charming market town of Godalming, and offers a centrally located, stunning collection of contemporary apartments and town houses. Lauded as one of the best places to live in the UK, Godalming offers a high quality of lifestyle with a genuine sense of community in an irresistible blend of town and country living. Day to day living is easy, with a large Waitrose opposite Prime Place and a Sainsbury’s superstore just around the corner. As you'd expect in a market town there's a regular weekly market and this High Street often plays host to a large range of markets, where you can soak up the lively continental atmosphere. With its tranquil setting, rich history and strong sense of community, combined with superb modern facilities, Godalming is a very special place to live. Just 47 minutes by train from London, but a world away, Prime Place truly represents the best of sophisticated town and relaxed country living. Specification and finish includes (not a definitive list) kitchens by Paula Rosa-Manhatten, bathrooms by Porcelanosa, ROCA sanitary ware and flooring being carpets to the bedrooms and laminate to the living areas and hallway. Add to this a comprehensive range of included white goods (oven, hob, extractor, dishwasher, fridge freezer and washer dryer) and you can get an idea of just how ready to move in these apartments will be. For further information please visit www.primeplace.co.uk (please copy and paste into your browser). Please note internal images are indicative only and are from a previous Prime Place development. 2 allocated parking spaces in the underground car park.